I’m in the middle of my summer sabbatical. As some of you know, each summer I take time off from my life in New York City and retreat to my on-again off-again childhood home of Vermont. This is the loveliest time of year in one of the loveliest places on earth. (That’s a fact by the way, not some silly opinion; seriously, check wikipedia.) The Champlain Valley of Vermont: the western side of the state, close to Lake Champlain, and not as far north as you can get, but pretty up there. It is where my heart feels most at home, most at ease. My father and stepmother have the good fortune of calling this place home year round. 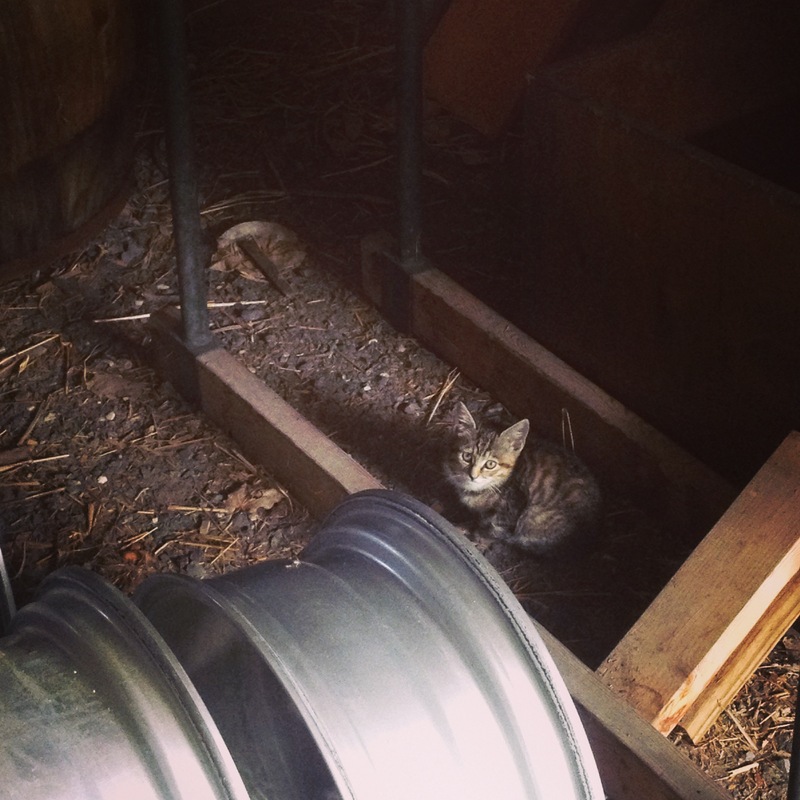 Up here in the summer I can swim in their pond, shower outside under the stars, read in the hammock on the back porch, and this month, play—or attempt to play—with the three new kittens that were born in their garage. We pick chard and kale and cukes and tomatoes and dill and basil from the garden. It’s been a good summer for me so far but not without its challenges. I have been working harder than almost any other time in the past few years, while also tending to a tender heart. As you may have noticed I have not been too focused on making or writing about food and I miss it. Although I am editing a cookbook this summer and it’s been both a great pleasure and challenge and once I’m done with the manuscript can hopefully share some of the recipes here. 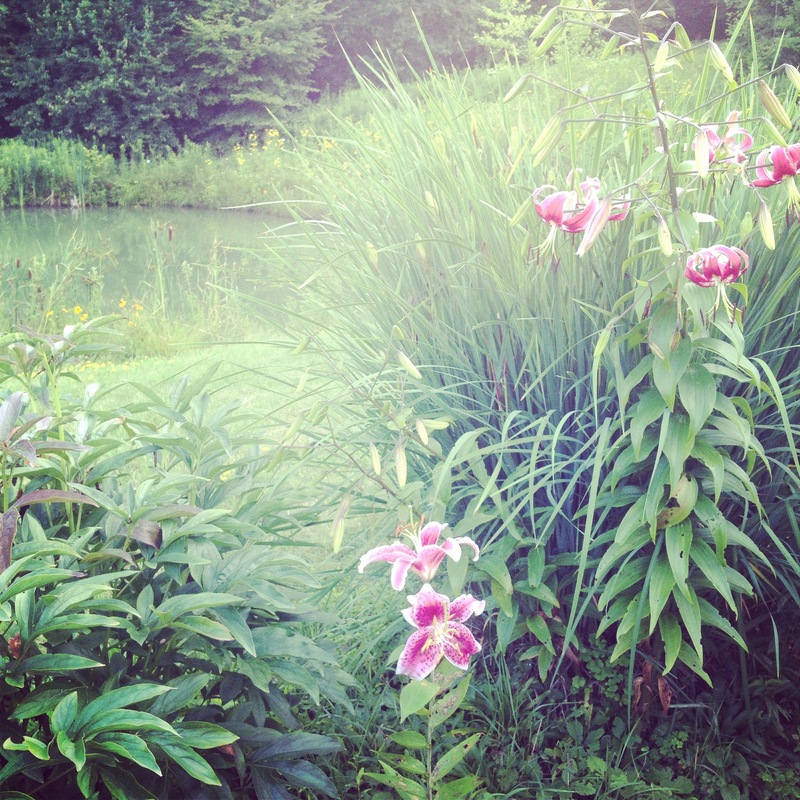 The only hitch in these lovely summer sojourns is that my time in Vermont must come to an end, and as much as I like Brooklyn, I never want to return to my 400-square-foot apartment or riding the subway or meetings or general lack of lakes to swim in. While up here though, I, on occasion, leave what we call “the compound,” and venture out to swim in the lake, meet friends for dinner at Black Sheep Bistro, get pastries at Vergennes Laundry, shop at the Middlebury Food Coop (where I worked in high school! 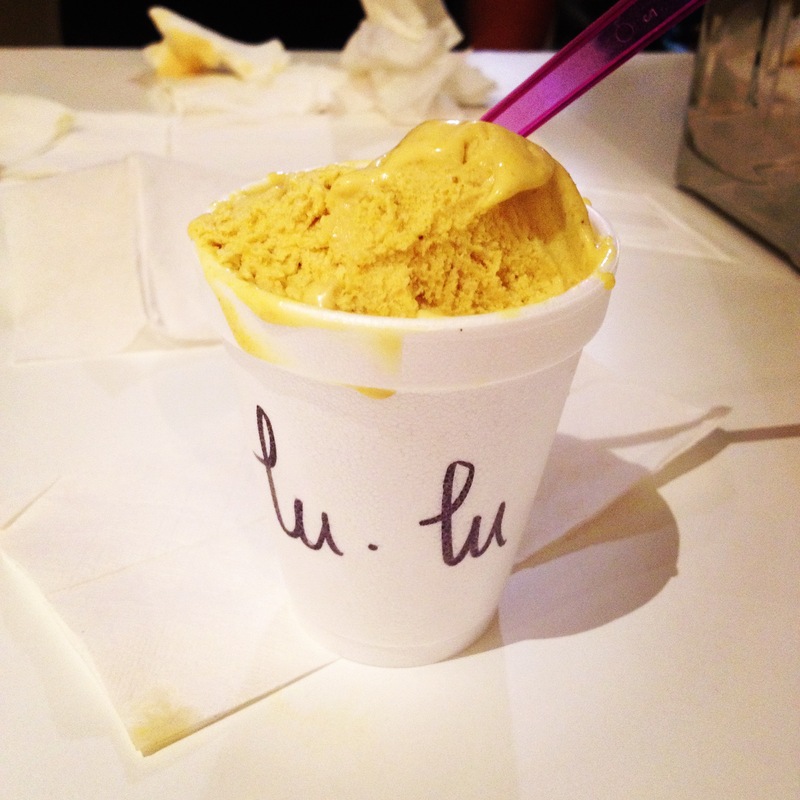 ), eat ice cream at Lulu’s in Bristol (slumdog millionaire ice cream flavor anyone? ), or, like I did today, go blueberry picking. 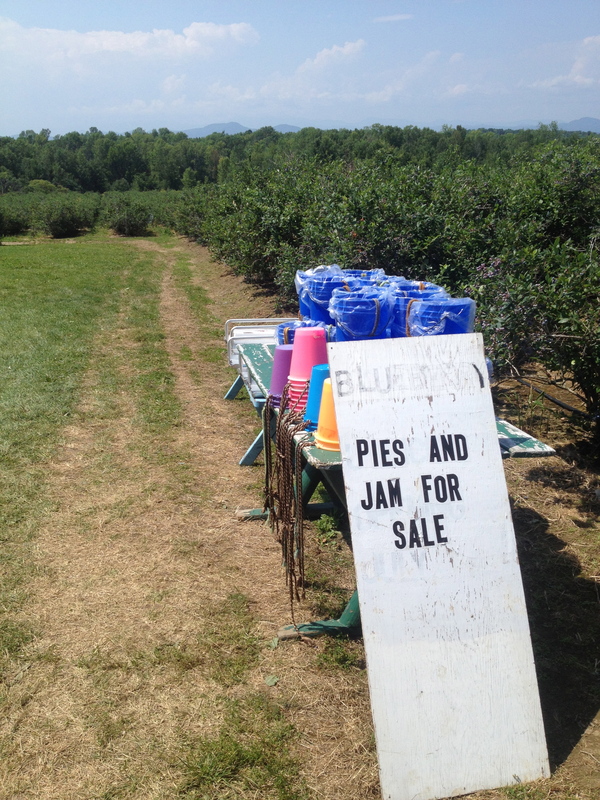 Pelkey’s is the go-to place to pick blueberries in this part of the state in August. I’ve been doing it every summer for the last number of years in a row. Here’s a blueberry cobbler recipe on my blog from July 2011 (and an unrelated potato and green bean salad from July 2012, and a summer roundup from Vermont in August 2012). I picked six pounds of blueberries today in just under an hour. I would have stayed and picked double that but I was with friends including a one-year-old in need of a nap and it was about 85 degrees and I was without a hat to block the sun. So, what to make with all these blueberries? 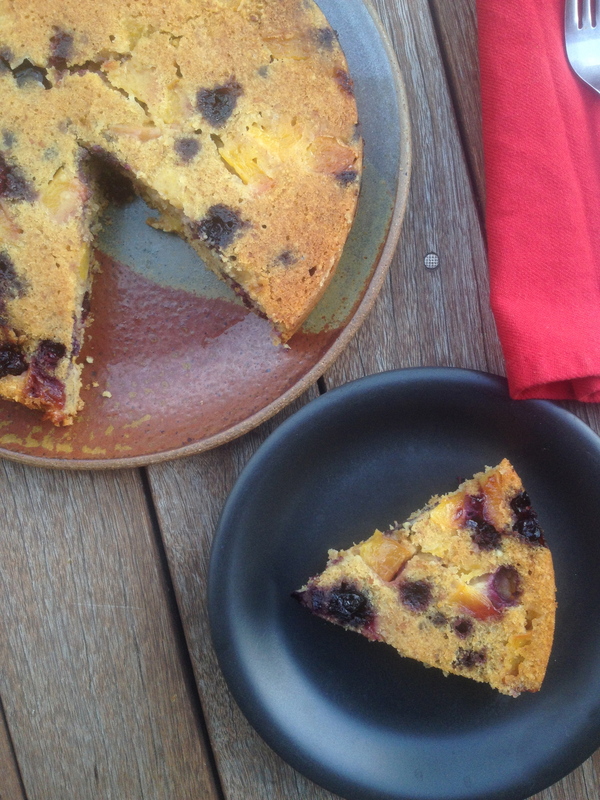 My friend Emmanuelle gave me a great idea the other day: Nigel Slater’s Cake for Midsummer, a not-too-sweet peach-and-blueberry inflected cake with hints of almond and orange zest. Slater, being from the UK, writes in the metric system of course, but so does the chef I’m working with and so metric to imperial conversions have become a snap for me. Grease and flour an 8- or 9-inch round cake pan. Preheat the oven to 340 degrees Fahrenheit (170 degrees Celsius). Using an electric or stand mixer, cream the butter and sugar until pale and fluffy. (Use good butter if you can, it makes a difference here in the flavor.) One by one add the eggs and beat until combined. In a separate bowl, combine the flour, baking powder, salt, and almonds then add, gradually, to the butter and sugar mixture. Add the orange zest, splash of juice, vanilla, and incorporate. 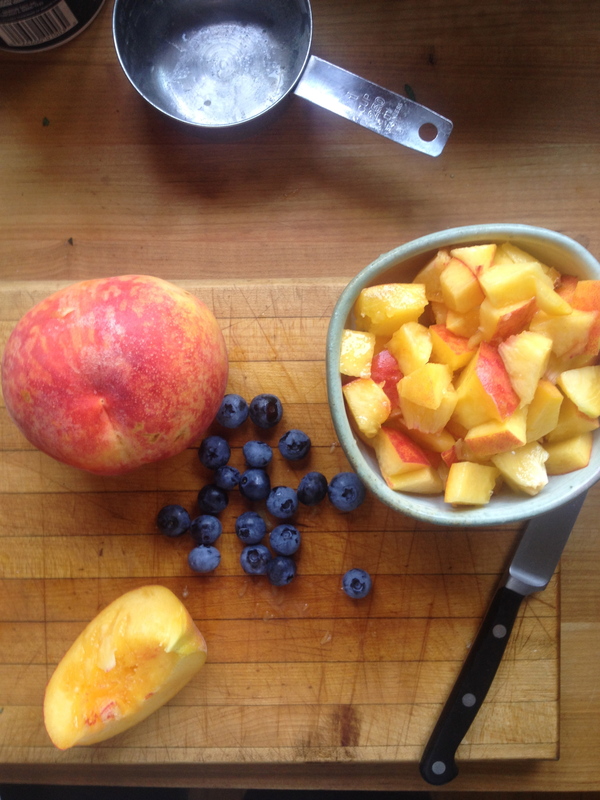 Then fold in the chopped peaches and blueberries. Transfer the mixture to the cake pan and bake for 50 minutes to an hour and ten minutes, depending on the size of your pan. My 9-inch pan required about a 57-minute baking time. An 8-inch pan might take an extra five minutes or so. Stick a toothpick in and it should come out clean. 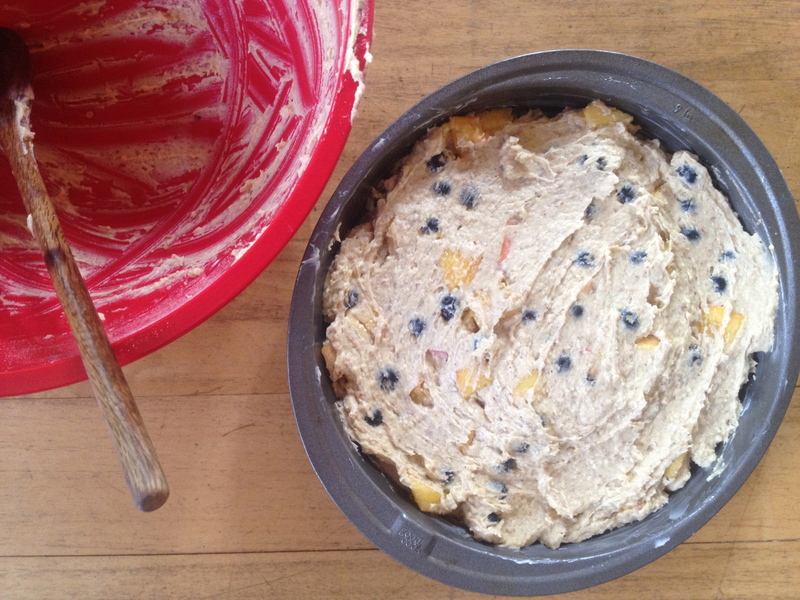 Let the cake cool before sliding it out onto a serving plate. Some unsweetened freshly whipped cream would be a nice accompaniment, as would a strong cup of tea. *I think a neat substitution would be cornmeal in place of the almonds. Or, buckwheat flour in place of the all-purpose flour.